On a recent trip to Istanbul, I belatedly discovered a museum that I’d love to have seen before I wrote my book, Circumference: Eratosthenes and Ancient Quest to Measure the Globe. It was the Istanbul Museum of the History of Science and Technology in Islam, an institution that opened its doors a few months after the text of Circumference was finalized. As the book discussed not only ancient Greek science but its legacy among Muslims, the Museum’s incomparable collection of scale models, drawings, and animations, set in the leafy former grounds of the Sultan’s stables at Topkapı, would have offered a gold mine of information. I was poring over the exotic time-pieces, astrolabes, armillary spheres, and other antique contraptions when the stranger approached me. He was a Turk, spectacled and dressed in typical Turkish graduate-student style of button-down white shirt and knit slacks. He bore a clipboard, and he apparently was looking for foreigners like me. “Excuse me, sir,” he said. “Are you interested in Muslim science?” A strange question, given that I had obviously plunked down ten yeni lira to haunt the galleries on a beautiful June afternoon. What an odd question to ask a stranger!, I thought. And what luck for him to ask it of me, someone who wrote a book about the man who first ascertained the true circumference of the earth. What kind of luck remained to be seen. My new friend shook his head sadly, as if I were a dancer attempting a grand jeté who only managed to trip over himself. “It was first in the Quran, that the prophet Mohammad, May Allah honor him and grant him peace, first revealed to humanity the true nature of the universe.” And he began to ruffle through the papers on his clipboard with the evident purpose of finding some literature. Perhaps it was my turn to look at him sadly, for nothing about made like an ostrich’s egg necessarily specifies a spheroid Earth. Strictly speaking, the verse could just as well be describing a flat, ellipsoid one. And indeed, in some translations the Surah reads “…Allah spread the earth out,” which seems to imply a certain flatness. But what did it matter exactly what the Quran said or meant to say? “Eratosthenes measured the circumference of the earth in the third century BC. That’s eight hundred years before Muhammad,” I protested. 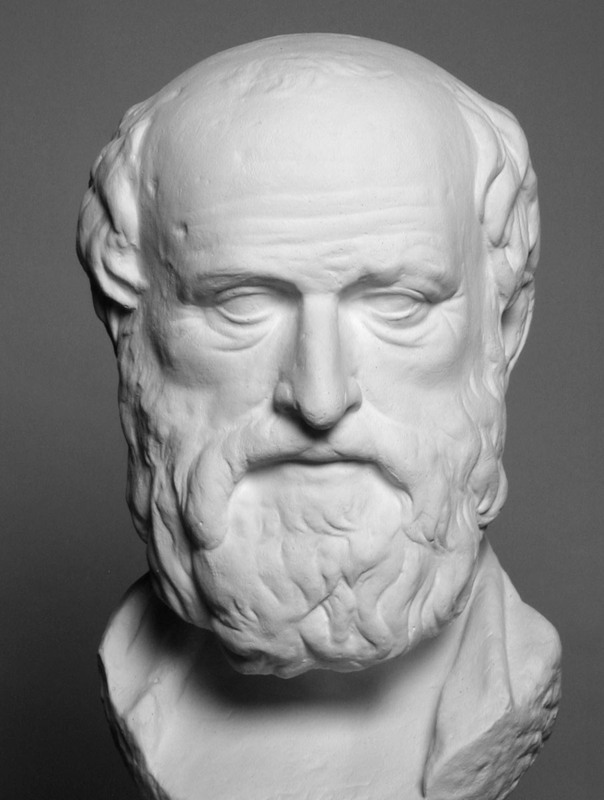 Eratosthenes was a man of learning, becoming the chief librarian at the Library of Alexandria. He invented the discipline of geography, including the terminology used today. Image is in the public domain via imgkid.com. He stopped rustling for his literature. In his eyes settled a certain resignation, as if realizing that he had attempted to crack too tough a nut. “It is very good. I thank you,” he said, and smilingly withdrew, possibly to find a visitor with a worse grasp of basic chronology. The encounter was brief, but left me with lingering unease. This was not because the man’s argument was so easy to refute—plenty of crazy ideas stand on less firm ground than his. It was because such notions of divine foreknowledge in the Quran, which (I subsequently learned) was notably promoted by a French physician named Maurice Bucaille in his book The Bible, the Quran and Science, take such a different tack than garden-variety science denialism. In Bucaille’s world, the findings of science are not only anticipated by Muhammad and other prophets, but retrospectively approved by them. In a way, it is a far more ingenious way to control science than simply wishing it away. If the sphericity of the earth was already there for all to see in the Quran, then the Quran’s authority against stuff that isn’t there is, by implication, all the stronger. The overt message of Museum of the History of Science and Technology in Islam is a celebratory one, proving that in many respects Muslims were once far ahead of their European counterparts. Alas, the subtext is less happy, because it naturally begs the question, “So what happened?” For us in the West, it should offer a cautionary message too, for no scientifically literate society is guaranteed to remain so forever. 500 years from now, will somebody open a “Museum of the History of Science and Technology in the West” in New York, to prove to scientifically dominant east Asians that yes, we backward, superstitious Americans once did some brilliant things? The answer to this question surely lies not in our Scripture, but in ourselves. NICHOLAS NICASTRO PhD has taught history, anthropology, and psychology at Cornell University and Hobart-William Smith Colleges. He has written five novels as well as short fiction, travel and science articles for The New York Times, The New York Observer, Film Comment, and The International Herald Tribune, Archaeology, and more. He now lives in northern California.